Begun in 2005 by veteran director and actress Laurice Guillen, Cinemalaya is not merely an annual film festival. Filmmakers from all over the Philippines present their projects to the Cinemalaya Foundation, a non-profit group run a little like a production company beholden to neither the government nor shareholders. From the hundreds or so submissions every year, 10 independent filmmakers are chosen as “finalists.” They are each provided ₱500,000 (approximately $10,000) and given one year to complete their films, which will be screened in competition at the next Cinemalaya festival. Although Cinemalaya controls what films get made, screening rights and even the venue through this model of vertical integration, it does offer many indie filmmakers a certain amount of safety. Cinemalaya doesn’t try to control the productions themselves, and the Cultural Center of the Philippines (CCP), the main venue for the festival, is one of only two places in the island nation where government censorship can’t interfere with a filmmaker’s vision. However, as I spoke to more and more people, be they veteran attendees, film critics or tireless directors in the Filipino film industry, I noticed a tiny schism between a small minority of Cinemalaya attendees and the festival itself. Over the more than 10 years since its inception, Cinemalaya has grown from benefactor to something akin to indie kingmakers. Add to this the announcement this year that Cinemalaya had started their own film school, the Cinemalaya Film Institute (CFI), with the express purpose to “professionalize film practitioners in various aspects of film production.” The fear that this “professionalization” – as a product mainly of people passionate about the medium of film but have no aspirations of “going Hollywood” – is creating a divide, moving one step closer to obliterating the separation between indie and mainstream. 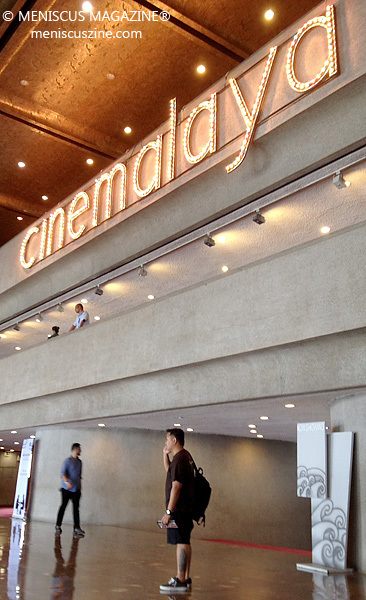 Despite the festival’s noble intentions, due to behind-the-curtains budgetary issues – perhaps related to recent developments – this year Cinemalaya only screened short films for competition, while the feature length competition was postponed until 2016. (That said, the 2015 finalists received ₱750,000, which was 50 percent higher than the usual monetary award.) However, thanks to a 10-year retrospective chronicling the Best Hits of Cinemalaya and the Filipino indie scene, this neophyte to Philippine cinema finally got the opportunity to catch up on all the films I had read about for so long but had never gotten the opportunity to see. The cache of films and filmmakers that Cinemalaya has nurtured over the last 10 years is remarkably varied. “Pepot Artista,” which won Best Feature during the festival’s first run, is a “400 Blows”-esque story about a young boy’s antics as he tries to become a big movie star. Sprinkled with references to Philippine and world cinema, an anarchic “anything goes” visual style, and the prevalent use of nostalgic motifs, it’s quite easy to fall in love with the film. I wouldn’t be surprised if “Ang Babae Septic Tank,” a 2011 satire on the Filipino film industry and winner of that year’s New Breed award, wasn’t in some way indirectly inspired by it. Two masterpieces, both acclaimed when they were first released, had another opportunity to wow new viewers. The first, “Sana Dati,” which won Best Film in 2013, is a contemplative love story set during a wedding. Unlike typical romance dramas which require happy endings for the couple-to-be, Jerrold Tarog, the writer-director, focuses on what happens after a relationship has ended, and the emotional struggle with re-committing one’s heart to another person. Similar in theme, Sigrid Andrea Bernardo’s “Lorna” was one of my two favorite features at Cinemalaya. A genre mishmash of film noir and the romance melodrama, Shamaine Buencamino plays the eponymously named Lorna who has struggled all her life with love. The film charts every indignity Lorna suffers all in the name of love, but this isn’t some Hollywood rom-com where the female lead is just some weeping violet. Bernardo and Buencamino actually succeed in creating an engaging, funny, feminist love story. The most exciting side debut were two classics of Filipino cinema, “A Portrait of the Artist as Filipino” (1965) and “Karnal” (1983), recently restored and screened digitally for audiences at the fest this year. I sadly was not able to watch Marilou Diaz-Abaya’s “Karnal,” but I was able to catch “A Portrait of an Artist as Filipino,” my other favorite feature alongside “Lorna.” Shot in the mid-‘60s, Lamberto V. Avellana, a seminal figure in Filipino cinema and a well-respected theater director, took on the monumental task of adapting Nick Joaquin’s A Portrait of an Artist as Filipino, the playwright’s most famous play. Filmed in black and white, the film is set in Intramuros, an area synonymous with old Manila in the pre-World War II era. It is a family drama about two sisters and their father fighting to keep their somewhat antiquated way of life alive even as the outside world constantly threatens to take away everything they hold dear. Though a box office failure during its initial premiere in 1965 the film is surprisingly modern in its sensibilities even in spite of its age and theatricality of the material. Add to that the fact that the entire film is in English with a few smatterings of Spanish and you have to wonder how such a film was even green-lighted. In contrast, “Bwaya,” which won the New Breed award last year and screened at Busan, is a solemn somnambulist picture whose strained seriousness made the entire film a laughable affair – a quality that “Bambanti” (2015) and “Above the Clouds” (2014) also both share. These three recent features can be seen as many longtime festivalgoers’ greatest fear manifested: an affected serous tone, middlebrow concerns, and beautiful cinematography that dulls rather than engages the audience, all enemies of a vibrant indie scene. This mixed bag extended into the short film competition, where one of the two standouts was Martika Ramirez Escobar’s “Pusong Bato,” winner of the Best Short Film award. It’s a Sunset Boulevard-esque story of a woman who had enjoyed fame as a teenage star in a series of youth romance films in the 1970’s, but by the 1990’s is an aging hermit who spends her days watching her old films in VHS until a rock crashes through her apartment window. What strikes viewers about Martika’s short aside from the genuinely funny character moments and kitschy production design is the assured direction. What could have ostensibly been a hackneyed Saturday Night Live sketch is a yet another unique love story. The second short, which drew just as much love from the audience as “Pusong Bato” and even won the Audience Choice award, was Cebuano filmmaker Kenneth Dagatan’s “Sanctissima,” a hard-to-watch horror film about an old woman living in a dilapidated old house performing makeshift abortions for any young woman who comes to her door. Full of dread and visually gruesome moments, even at a brisk time of about 10 minutes Kenneth Dagatan’s picture is quite difficult to watch. The rest of the short films had some engaging moments, but none could really compete with the popularity of Ramirez Escobar or Dagatan’s shorts. Petersen Vargas was awarded Best Director for “Lisyun qng Geografia,” a story about the end of a friendship, and Darwin Novicio scored Best Screenplay for “Papetir,” not quite a standalone short since it was part of a feature that the director is planning to make. 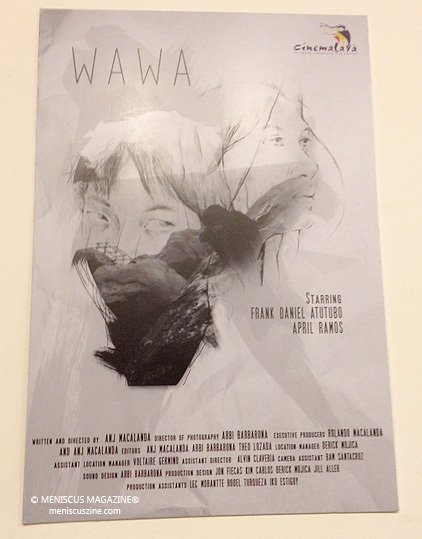 NETPAC (The Network for the Promotion of Asian Cinema) awarded librarian-turned-filmmaker Angelie Mae Macalanda for her short “Wawa,” an adaptation of a well-known Philippine poem dealing with grief. Although this was my first year at Cinemalaya and no new features were screened, I got what I came to Manila for: an education on the current state of Philippine cinema. Many film festivals seem to be cut from the same cloth, but Cinemalaya was unlike any other. Usually in screenings there is a somewhat large group of industry people, but the Cinemalaya crowds were mostly made up of college-aged kids excitedly entering screening after screening. It was unbelievable to me just how cinephiliac these crowds were. It may be idealistic to say this, but if this level of cinephilia and Cinemalaya’s commitment to letting more silent voices being heard continues, Philippine film could become one of the next breakout national cinemas to watch out for. Either way I can’t wait for next year to experience another round of great films and surprises. For more information on Cinemalaya, go to cinemalaya.org. This is the third article in a new series of reviews by Meniscus Magazine reporter Rex Baylon titled “New Philippine Cinema,” which focuses on rising Filipino filmmakers and their work.